Are you looking for a fun way to add a little farmhouse charm to a room? 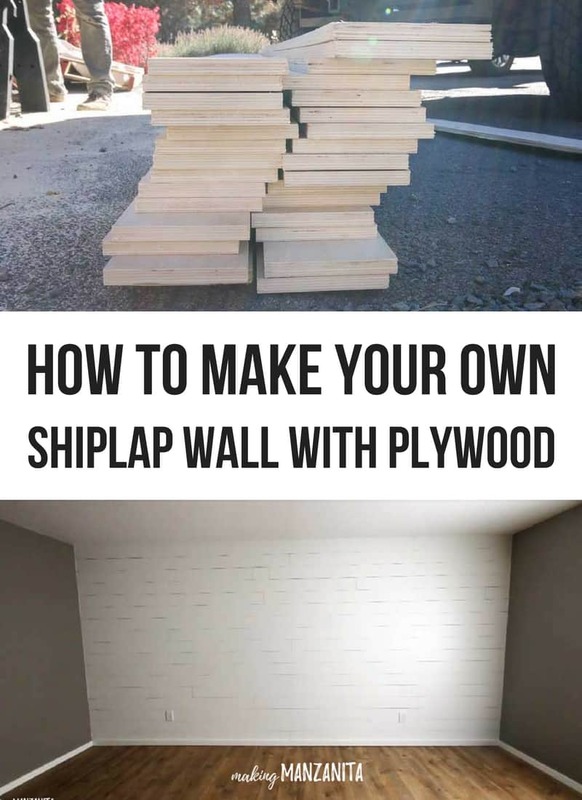 You can make your own shiplap wall with plywood! Learn how we saved money by making our plywood shiplap instead of buying the premade shiplap. 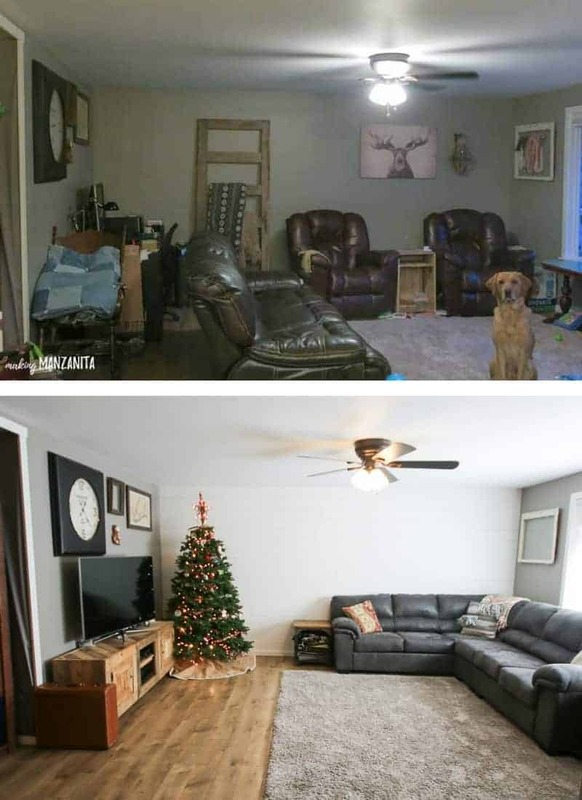 It all started when we rearranged furniture in our living room and opened things up a bit. As a result, the decor I had planned for the big wall in our living room just wasn’t going to work anymore. 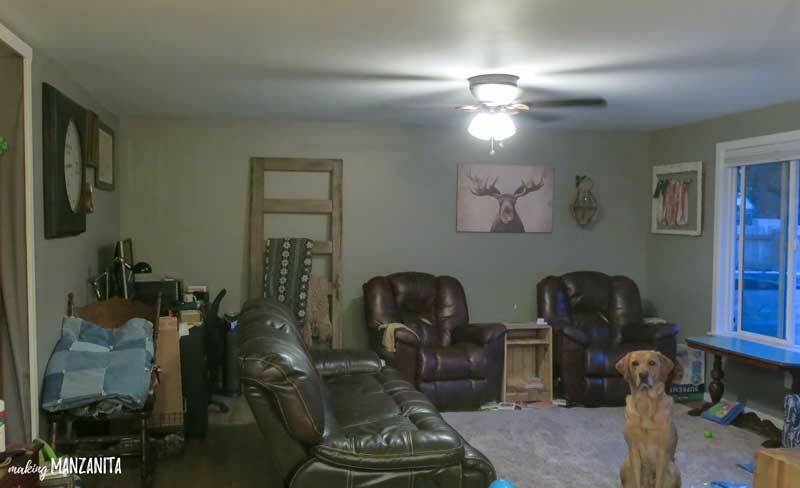 I stared and stared and stared at the big empty wall in our living room. 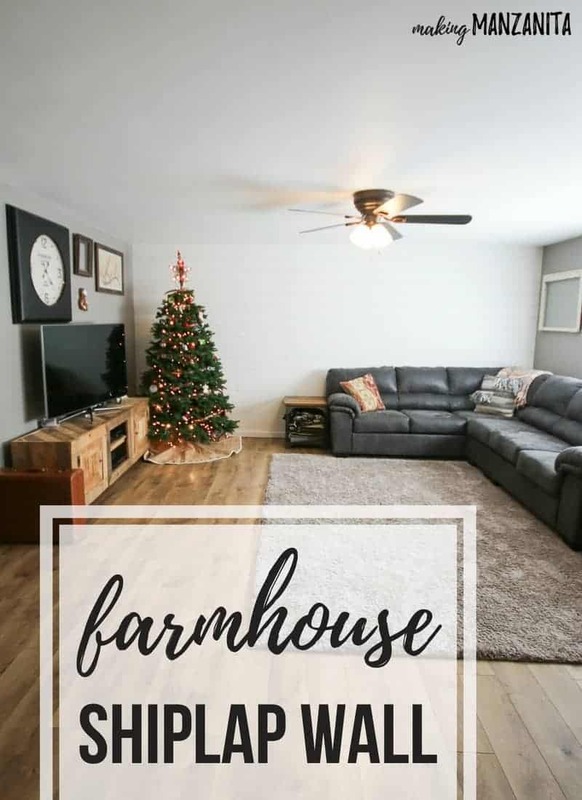 I was trying to think of something that had scale and fit in with our furniture but also farmhouse character. Then it hit me…. we needed an accent wall. 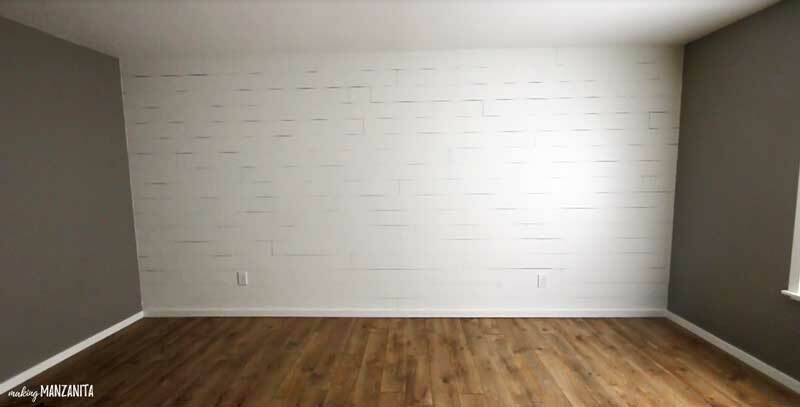 Not just any accent wall. A shiplap accent wall. I knew that bringing in shiplap on one wall works well to bring a ton of farmhouse charm and it makes the room feel even larger. We added a faux shiplap wall in our farmhouse master bathroom and you guys LOVE it. It’s one of my most popular posts to date. We thought about using the same technique of stacked plywood planks with nickel sized spacing that we used in the bathroom for the shiplap accent wall in our living room. To be honest, we totally could have used that technique. But, although I absolutely LOVE our shiplap wall in our bathroom, I wanted something that was a little more authentic shiplap looking for our living room. I knew I was going to be sitting on the couch staring at the shiplap wall all of the time. When we started looking at the costs of buying premade shiplap, we realized it was going to be an expensive project. We even considered buying the MDF shiplap, which is much more reasonably priced. 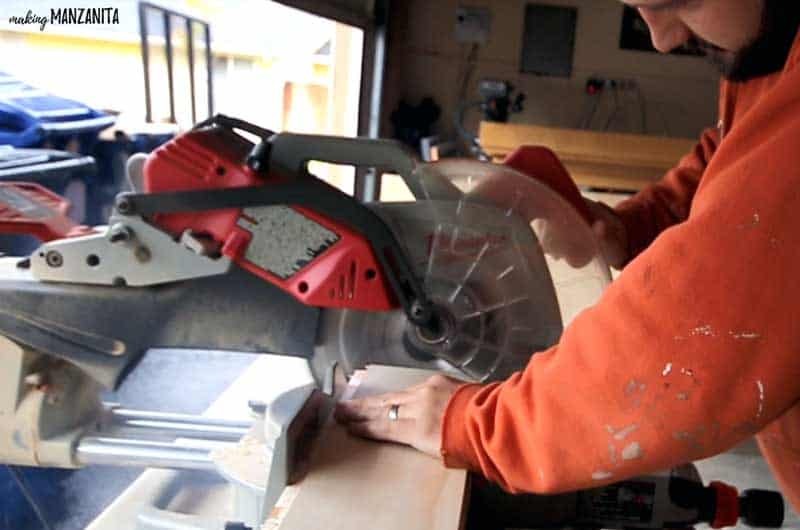 In the end, Logan came up with a simple way to make plywood shiplap using just the tools we had in our garage. 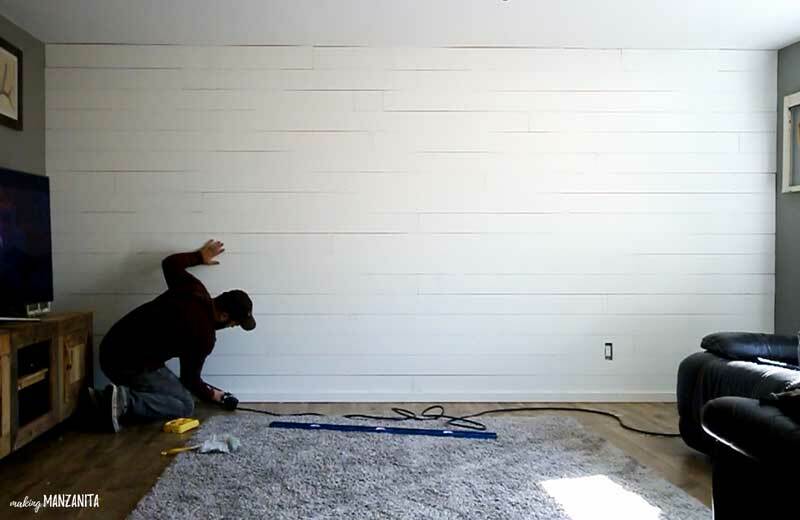 UPDATE: Scroll down for a video of how this shiplap wall with plywood comes together. Just a little look back..here’s how we started (before we rearranged the furniture). Pardon the disaster!! This plywood shiplap post contains affiliate links, but nothing that I wouldn’t wholeheartedly recommend anyway! Read my full disclosure here. Step 1: Rip plywood into 6 inch wide planks. First, start by ripping your plywood sheets down to 6 inch wide planks. You can use a table saw to do this or a Skilsaw with a rip fence like we did. Be sure to cut enough so you have plenty to cover your wall surface. Next, you will router the tops and bottoms of the plywood planks so they fit together. We used a router with a router table to do this. If you have a wood shaper, you would want to use that instead. Since the router is not really made to handle jobs of this size, we had to do these in shifts so it wouldn’t overheat the poor little router. It definitely worked, but you just want to be smart here. Router out 1/2 inch on both the top and the bottom of the plywood planks. This makes the plywood pieces have a 5.5 inch reveal. Step 3: Cut planks down. Depending on the look you are going for, cut your plywood planks down to the lengths that you want. Alternatively, you could keep the 8 foot runs. Or you could cut the planks down to 1/3 and 2/3s of the runs for a more patterned look to your plywood shiplap wall. 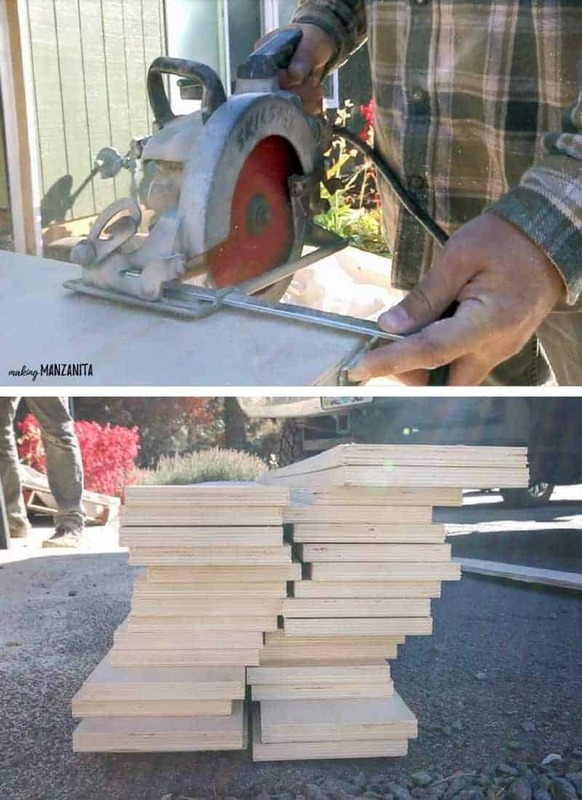 Using a chop saw, cut the planks down to your desired lengths. We cut ours at random for a more rustic look to our shiplap accent wall. Step 4: Paint shiplap planks. We opted to paint the shiplap planks before installing them on the accent wall. This saved us some time because we were able to quickly roll the paint on the boards in the garage and not have to worry about covering up the floors or taping anything off. We did have to do some touch up later when we were done installing, but this still was a big time saver. We used a 4 inch 1/4 nap smooth roller to paint the shiplap planks. 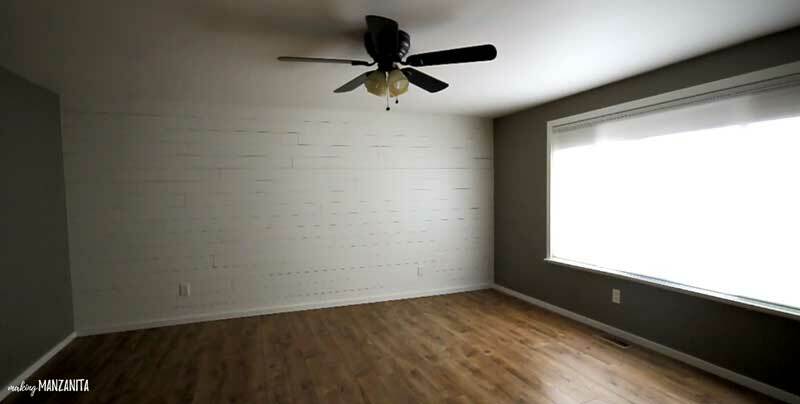 While the planks are drying, you can start prepping your wall. 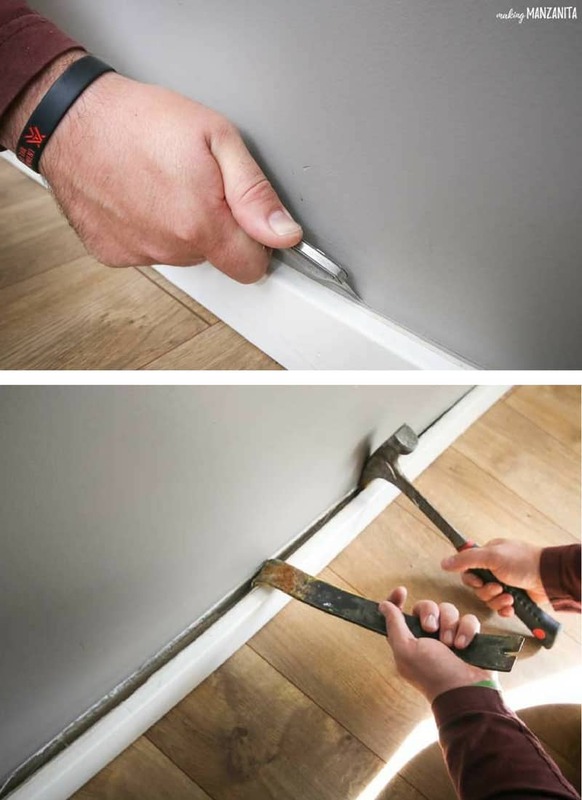 Run a utility knife along the top of the baseboard where your caulk line is. 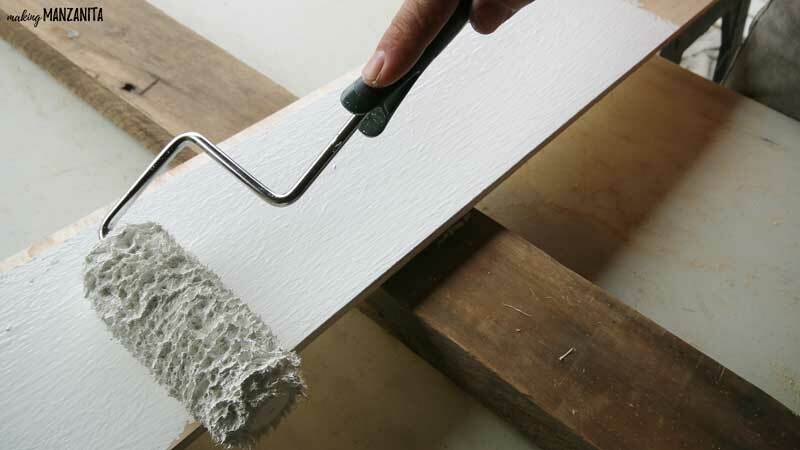 This will help prevent paint peeling off the baseboard when you remove it. Next, use a pry bar and hammer to get it behind the baseboard and pry it off of the wall. 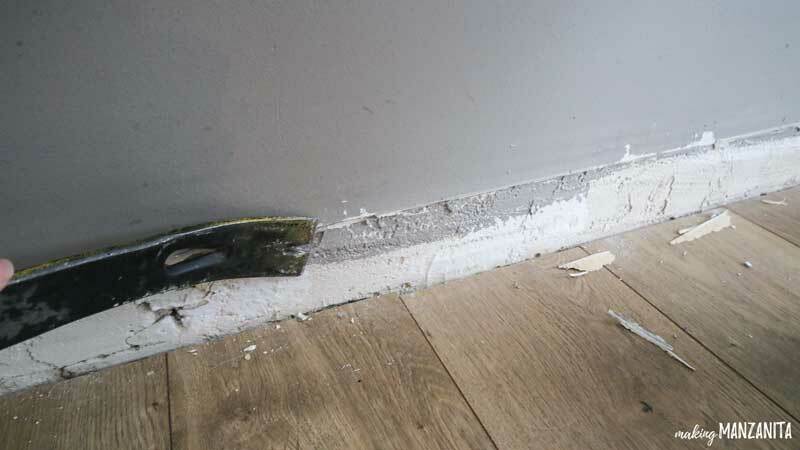 Try to not damage the baseboard and keep it in one piece if possible. 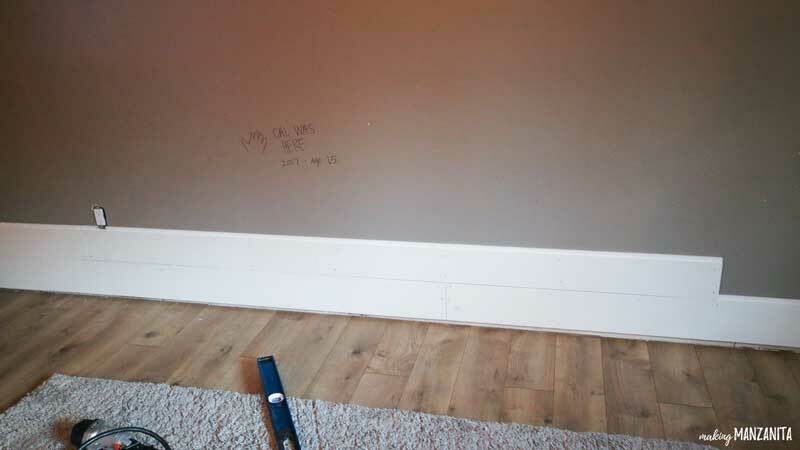 If you are removing more than one piece of baseboard, be sure you label them so you know how to put them back on! Step 6: Scrape wall under baseboards. There may be some extra plaster under your baseboards. Just scrape it off and make sure the wall is mostly even. Then, grab your ShopVac and clean up the area before moving on. It always helps to work in a mostly clean area, don’t you think? Step 7: Remove outlets and/or light switches. Turn off power to the outlets or light switches and remove the covers. Be sure to cover any exposed wires with wire connectors. If you can, keep power off to those light switches and outlets for the remainder of your install. Step 8: Attach bottom boards with level. Grab a partner for the first few bottom boards of the install. You definitely want to be sure the first boards are nice and level. Have one person hold the board in place and the other person look at the level and nail in the first boards using an air compressor & finish nailer. Step 9: Continue stacking and attaching boards. Continue working your way up the wall and stacking and nailing in the shiplap plywood planks. 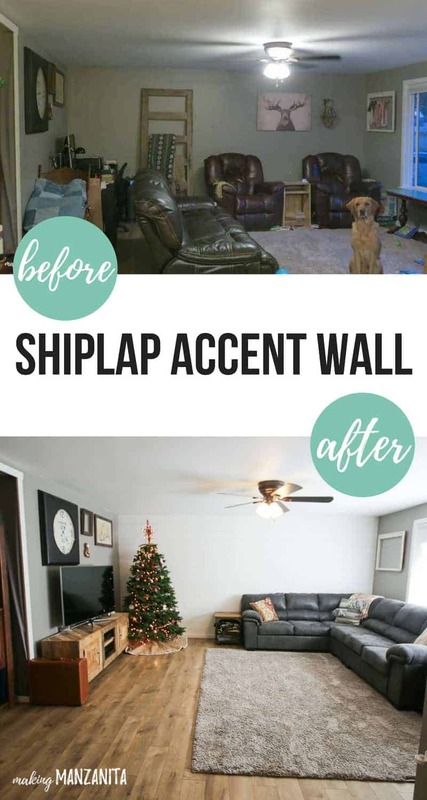 We definitely kept the pattern on our shiplap accent wall very random, which made it look and feel more rustic AND allowed us to use smaller scrap wood pieces and really make it cost effective. 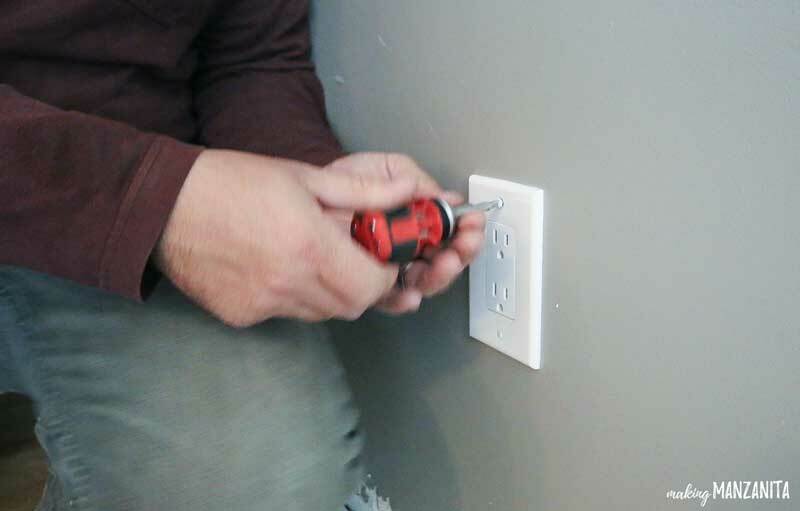 As you come across outlets and light switches, you’ll need to cut around them. Measure it and cut with a jig saw. Cut to fit these electrical box extenders that you’ll put in after you’re done. Step 10: Finish top row of shiplap wall with plywood. Once you get to the very top of the wall when you need to install your row of the shiplap plywood planks, measure the gap from the ceiling to the reveal on the last row you put up. If your ceiling is level, your gap will be the same all the way across the wall. However, if your ceiling is NOT level, your gap may change. You may need to rip the planks individually to accommodate a change in the ceiling height. IMPORTANT: Be sure to use pieces that are only routered on the bottom side for the top row. After the shipwall plywood accent wall is all done, you can reattach your baseboard to the bottom of the wall. Step 12. Add outlet extenders. Next, you’ll need to add electrical box extenders to your outlets and light switches to bring them out the to the new wall level. Step 13. Caulk the gap on the top and sides. For a nice, finished look you can caulk the gap on the top of the shiplap wall and the sides. Alternatively, you could also install trim pieces of the top and/or sides. Lastly, touch up any areas of the shiplap wall with plywood with your paint. There may be areas that got scuffed or bumped during the install. We chose not to fill in our nail holes. I ended up liking the rustic look to the wall with the holes in place. However, if you wanted a more finished and crisp look to your wall, you could fill the holes in with wood putty, sand and then paint over putty. I’m so in love with our farmhouse shiplap wall with plywood that we added to our living room. I am so sad that I was only able to enjoy it for a short while before we moved to our new house! I think I’ve learned my lesson and we’re going to try not to put off fun renovation projects like this until we’re ready to move out of this new home. We were able to save money by creating our own shiplap plywood using just the tools we had in our garage. The shiplap wall looks authentic and add so much farmhouse charm to our living, don’t you think? 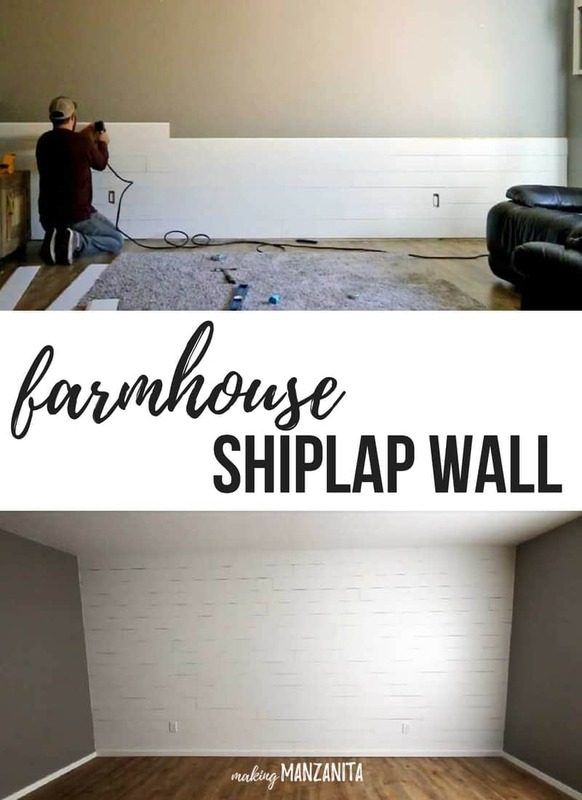 Where would you put a shiplap plywood wall in your house?? 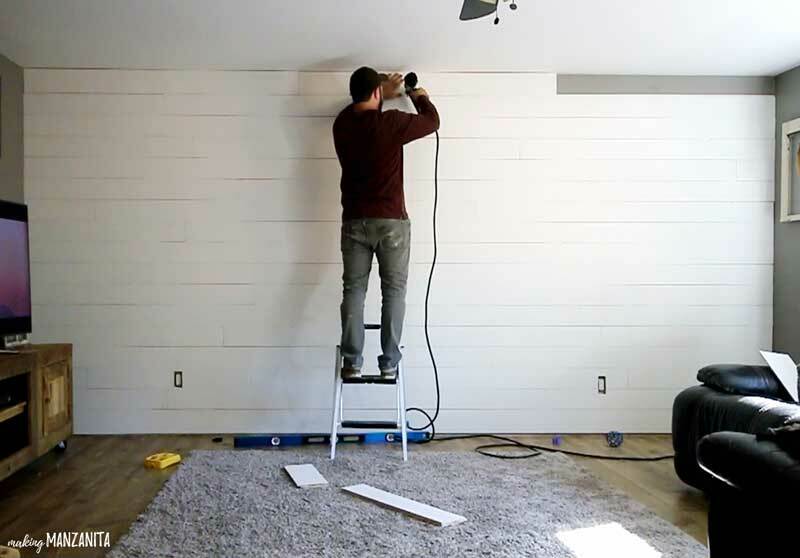 Ready to see a little video of how this shiplap plywood wall comes together? If you love DIY videos, be sure to check out my videos page for more. « We moved!! 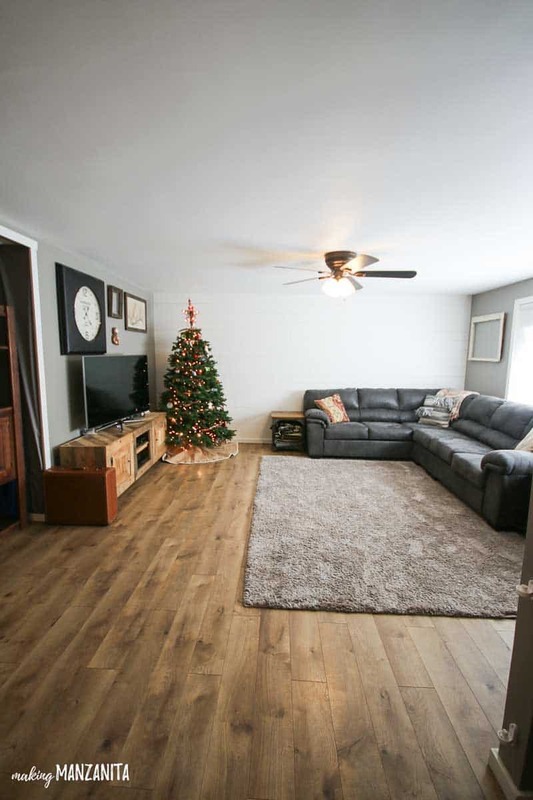 Welcome To Our New Fixer Upper! Is this in your new house already?? What was the total cost of supply for wall?? Hi! Just found your blog through pinterest & absolutely love! Question, what did you route these boards but not the ones used in the bathroom? I think both turned out just great!! TIA! Do you remember what color of paint you used on the walls?